I have a new 2012 F150 Ford XLT which does NOT pull my trailer as well as my old truck. I was not comfortable with the amount of sway and could not go over 50mph. On Sunday night after returning I purchased the Equal-i-zer. On Thursday it arrived and we literally had to look at the instruction book once. After 30 minutes the installation was completed and no extra parts... I merged onto the highway to test the equipment. I reached a cruising speed of 70mph and had absolutely NO SWAY. The fact that I now have a piece of mind knowing that the Equal-i-zer is less than that of a life when you are towing without the proper equipment. Other products may be available but research was extensive before I purchased the Equal-i-zer. The shear strength is visible and the product is very well made. The fasteners are heavy, the hitch is heavy, and the stabilizer bars are heavy. This is a 5 star product and every trailer owner should own the Equal-i-zer. The best thing about all of this is it was a product that was sold without a gimick and does the job well. Hat's off to you!! Scott S.
This hitch was used on a 2002 f150 pulling a 26 foot Grey Wolf camper. The dealership initially set it up but didn't read the directions. The hitch worked but wasn't operation at full capacity. I went through the directions spent 10 minutes moving the trailer brackets and adjusting the ball angle. Pulled the trailer through a thunderstorm over potholes while getting passed by 18 wheelers and never had white knuckles. The hitch operates very smoothly, even when turning sharp and backing into tight spots. Fantastic Hitch! etrailer had the best price by far, arrived within 4 days of placing the order in excellent condition with no shipping damage or missing parts. Mt RV Dealer did the original setup, but their installers apparently never watched a video on proper installation, as they took no before or after measurements of my truck wheel well height, never used a torque wrench, and placed the sway bracket assemblies at 27 inches from the ball when 32 inches (factory recommended distance) was easily available on the trailer. Many other install errors as well like incorrect number of spacer washers and incorrect L bracket mounting hole positions, all of which caused my 2016 Ford F-150 to squat while towing. Never assume the dealer service department knows what they are doing! Once home, I set the hitch up as instructed by Equal-i-zer without too much difficulty. This hitch now has my truck sitting level and tows like a dream with very little sway at all, and I tow a 35 foot travel trailer. Keep the hitch lubed as instructed, and use the optional sway bracket jackets and this hitch is fairly quiet. Well worth the money, no more white knuckles!! I cannot rave enough about this set up. I tow about a 10K trailer (RV when fully loaded) with a Ford F150 (yes an F150... but it was built for towing heavy and in fact, is actually rated better than my F250 Super Duty to tow heavy). But it is working hard, no doubt and with this hitch I really cannot tell the trailer is there. In my humble opinion, best on the market, even tows better than my goose neck did. I have put the same set up on my 4 horse trailer and will do so for my car hauler soon. We have about 2000 miles on the travel trailer using the Kurt tru-track hitch system. I have used it on a 2014 f150 and a new 2018. Both are MAX tow models. It works well in all my driving conditions so far. No complaints at all about. I grease the fittings every time( ok maybe not every time) but I ensure the parts that need it are lubricated. Would buy another one today if I needed to replace mine. My TT weighs has about 750 lbs. of tongue weight. Only suggestion is to purchase one of those hitch holders so when you remove it from the truck it will not give you a hernia. The Curt anti-sway product worked well but... The components were well made, easy to assemble and eventually worked very well to minimize my 26ft travel trailer sway. It would have earned all 5 stars from me, but the setup instructions for my 2015 F150 4x4 were NOT usable as written in the manual, thus causing me a lot of extra time and experimentation to optimize system performance! Pulled an 11,000 lbs enclosed trailer from Arizona to Rhode Island. Once I got the load adjusted, I didn’t have enough weight on the tongue, it worked well. I’ll buy it again and would recommend it. So far so good. I received the product yesterday, and have it looked over. I have read some reviews about some of the paint being chipped, this is true. etrailer, is a great company to work with. I received exactly what I ordered, and it is quality at a good price. etrailer also over communicates (this is awesome). I will, and already have ordered more items from them. 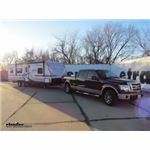 Truck: 2015 F150 crew 4x4 2.7L eco Trailer: Jayco Jayflight 4100 lbs dry Great product. Sway and bounce are eliminated. I use this WD hitch with my '17 Tacoma pulling a 3200lb travel trailer. Once you have it configured properly, it works great. The trailer tracks straight and true at 65-70MPH, and if a big rig passes you things don't get squirrely. It does OK when making turns in reverse, but I prefer to take a moment once I've reached my spot to remove the sway bars to minimize squeaking. Well worth the money! Great product and easy installation, if you take your time. I ordered this 400/4000 lb WD hitch to replace the same version that was the 600/6000 lb version. The 600 lb version was just overkill for my application ... and it was just WAY TOO HEAVY when installing and removing from the trailer/toad. If your trailer is less than the 400/4000 lb ratings, then I would definitely recommend going with this hitch. It's just so much easier to store, install and remove. I love this weight distribution system! I have a F150 (stock rear springs/hitch) which is pulling a 7'x16' enclosed aluminum trailer, which probably weights close to 5,000-6,000 lbs depending on how much I load it. Without this system, the trailer was tongue heavy and the truck had a noticeable rearward lean, handled poorly, etc. With this system, the truck sits within 1/2" level (the system is incredibly easy to adjust to achieve proper leveling depending on weight/loading), and I just got back from driving 1000+ miles towing the trailer, and the driving was incredibly easy compared to without this system. Those miles included highway, poorly paved highway, dirt roads, dirt roads with bad spring ruts/pot holes, tight parking lots, windy conditions etc. This system performed in all of them. Passing semis or vice versa? No sway whatsoever. There were even some nasty bumps at highway speeds (70mph) which induced some slight trailer wobble, which this system corrected right away. This system also allowed for tight turns, both in drive and reverse. The thing is quiet too! Detaching the system is very easy as well when the trailer is not in use. The torsion bars easily disconnect from the trailer brackets via the tool provided, and once off, you only have to remove the pin from the hitch side to remove the torsion bar. That way you don't have to carry the weight of the full system all at once back to the garage. All in all, I would highly recommend this product to anyone in the market for a weight distribution / sway control system. Other than some popping and creaking (normal for a friction hitch) this thing is awesome. I tow a 29', 8k lb toy hauler with a 2018 F150 HDPP truck, and it is a very stable, smooth, and comfortable setup. I've got some 3500 tow miles on it so far, in all conditions - wind, rain, dry, interstate and back roads. It is way, way better than the simple dual friction bar setup I had before. Easy to setup, easy to connect. Heavy, but 1200 lb rated so takes some beef to handle that. Really can't beat it when cost is considered. This is an outstanding hitch. Easy to install, we did it on our camping trip and the drive home was so much more comfortable then with the old weight distribution hitch. There was no sway whatsoever. We pull a 30 foot camp trailer with an F150 and the weight distribution with this hitch is unbelievable. I now have peace of mind knowing my new hitch will keep my trailer from swaying anymore. This is a great product and I highly recomend it. Bought the Sway Pro to replace a hitch that had separate sway control. The Blue Ox works better on the road as trucks pass us and I really like backing up without loosening the sway friction. This Blue Ox WDH does not come with a ball. Had to have U-Haul tighten the 50mm nut on the 2 5/16” ball. Odd torque value for the hitch bolts too? Etrailer matched the prices and delivered in TWO days! I've waited to write his review until I could comment on both etrailer's service and the hitch's performance. First the service: I couldn't believe how quickly this 100 lb. box arrived--two days! Everything was intact and nothing was missing. The customer support of these folks is just incredible. Their prices were as low as I found anywhere, and with their quality service I bought everything I needed here. Now the hitch. I bought the Curt C17057 WD hitch which has 1400# round bars, plus a pair of Husky friction sway bars for my 25 foot Airstream towed with a 2013 F-150 CrewCab. It's a really nice hitch/TT/TV combination. It controls sway really well, is virtually noise free and transfers weight appropriately, plus isn't nearly as heavy as the ProPride/Hensley hitches. I selected the Curt, in part, because it has grease zerks on the head, while some other candidates didn't. I couldn't be more satisfied! One year later, the Curt weight distribution hitch is performing perfectly.It does a good job of transferring weight to the tow vehicle, is quiet and was relatively easy to dial in exactly for my vehicle trailer combination.I coupled it with two Husky anti-sway friction bars, although I have only installed one of them because that has proven enough for my 25 foot trailer. An Eaz-Lift Husky anti-sway bar combination was suggested for me by AndyThomson of CanAm RV, but I substituted the Curt because I liked the greasezerks on the Curt. The Curt is a really well-made unit. Id buy it again,as well as the Huskys, which Ive found to be quiet and effective. Staff was helpful in helping me select product and accessories I needed for my Installation. My trailer has a tool box where the load hangers needed to be. A different mount solved the problem. Both etrailer and load equalizer get 5 stars. I’m on their mailing list and they carry an extensive line of products, many that I was totally unaware of. This opens new possibilities for future purchases. I use my truck to tow a 14,000 GVWR trailer and needed an equalizer hitch for towing heavy loads. I pulled the trailer heavily loaded for over 2000 miles while bucking 20 to 30 mph headwinds and crosswinds. It tracked like it was on rails and strong wind gusts were hardly noticeable. 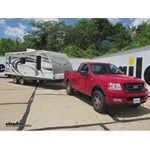 etrailer also has great articles regarding towing and other products they carry. Have used the hitch quite a bit in the past year with some pretty heavy loads. It has performed flawlessly and I couldn’t be happier. Would purchase this hitch again. So far no problems. Really like it. Tow bar works great - towing a 35 'travel trailer and have had no issues. Tracks great with very little sway. Takes a vew extra minutes to hook up, but well worth hte time. Great weight distribution system. Works well with my travel trailer. Install was easy and quick. I got it done within an hour. Fast delivery, great price, cant ask for more? This was to upgrade from 800 to 1200 TW, easy install since I only removed old and replaced new. Takes time to adjust properly but once done no more adjustments needed. I just installed a Reese straight line hitch. Instalation was easy. It took me about 5 hours to install. The instructions included were easy to follow. Some tools needed are large and may need to be rented or borrowed. I'm looking forward to pulling my camper with this new hitch. Used twice with daughter/ son in laws F350 and their camper pulling my trailer. Also multiple use worm my own F150 pulling my trailer. The weight distribution was mostly for the camper. The sway control has made pulling with my truck a dream. Absolutely no trailer sway! Used this hitch last summer to pull my 33 ft. camper withe 2004 Ford F-150. Have had absolutely no problems. I did add firmer spring support and don't forget to unhook the sway bar if you're backing up. I purchased this WDH to pull a 29-foot travel trailer behind my F-150. Other than the fact that the hitch head is heavy, hitching and unhitching are simple and the hitch has worked as expected. Good trailer hitch. I was using the basic chain weight distributing hitch with added sway control. This is much better. Yes good hitch. Works good no problems with it. Works great on a older 28 ft. 6000lb. restored Airstream with a F150 4x4 with anti sway electronics. Without we could only go about 55 mph and the trailer would sway. The truck would warn us to slow down. The install was a bit complex we were not too sure of the angle of the hitch but we followed directions and it works. We traveled about 6k miles on two trips. It stopped the sway even at 70mph . Many a giant truck flew by at 80+ it started to sway but the bars prevented it. Backing and tight turns are no problem. Adjusting the chains require some work and disconnecting, reconnecting a pain. would highly recommend to any one . Took me about 8 hours to get it setup perfectly, but it was well worth the time spent. I pull a 20 foot v-nose trailer behind a 2014 F150 5.0. Its about 6,000 lbs with my race car in it. It used to sway a bit in the wind and not track great. This hitch really makes driving down the highway easier. No sway now, and tracks much better. I think it is well worth the time and money and would recommend this hitch to anyone. Figured out on Saturday what type of anti-sway hitch I needed to order, receive and install by Wednesday night. Tried another site, they couldn't meet the deadline, turned to google and discovered etrailer. Called at 1 PM on Saturday and talked to Steve Z, he got the order placed, and promised to check the status and follow up with me on Sunday. Everything was delivered on Tuesday and that night the hitch was installed, a day ahead of schedule. I don't expect to have a high need for towing / trailering, but when I do I'll be checking and calling etrailer first. On a scale of 1 to 10 their customer service is a 15. Had a Fastway e2 liked it and did a fair job, sure was easy to hook up. After research and RV being at 30 feet, ordered the e4 and it made a difference you can feel. etrailer is a place you can buy with confidence and you always know where your order is during transit . Perfect and I recommend the E4 and etrailer. All I can add is it works and I want pull an every without it. Now that it is broken in it is quieter too. Was easy to install.. After installation I drove our camper down the highway on a windy day and I was very impressed how it worked!! I highly recommend this product very good price and it works!! This system works great for me. I have a Nissan Frontier and 21 foot TT. If you install this yourself make sure you watch every video and then follow the written instructions provided. You cant go wrong. This leveled my truck out and planted the front wheels firmly back on the ground. One word of warning. If you are parking your trailer on an incline and the truck and trailer aren't level move to a level spot, remove the bars and then back it in. Just makes getting the bars off easier. Every time I bought product from etrailers been nothing but excellent. Good product Fast shipping And the best price from professionals. If you towing deal with etrailer. Today on this 2004 Ford F150 Super Cab, we're going to install Part number PS49902. This is a Pro Series weight distribution system with friction sway control. To start off, we need our truck and trailer in a straight line, but separated. We'll go ahead and take a few measurements. First off, we want to make sure our trailer is level. Once you know you have your trailer level, we'll go ahead and measure from the ground to the top of the coupler. This is about 24 inches. Are both the spring bars of your Dual Cam setup riding up onto the flange of the cam? Reese would recommend that you check the location of the bracket that attaches to the trailer frame. I attached a picture of that. With the truck and trailer perfectly straight check to make sure that the cam is fully seated into the indent of the spring bar end. If not use the adjustment nuts to get them where they need to be. If you have a Blue Ox weight distribution system rated for up to 1,500 lb tongue weight and your actual tongue weight is 700 lbs you are most likely going to have a harsh ride quality. Keep in mind that the weight of any cargo behind the rear axle of the truck needs to count as tongue weight too. A better rated system for you would be the part # BXW1003 which has a tongue weight range of 750-1,000 lbs. Quick service and very good prices. picked up the 1200 lb spring bars and the newly designed reese sway control from you. Absolutely the best prices around. My local guy wanted 140 dollars apiece for each spring bar. Glad I found you.